You need to see below to see what rare I got. My video got cut off half way through filming… I’m not sure what happened, maybe my phone hard drive became so full that my Iphone decided to stop recording. I really need to upgrade my phone, I’ve had this one fore like 3 years. The rare I opened was pretty boring. 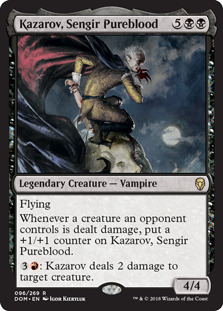 Kazarov, Sengir Pureblood . Not a particularly good card in any format. He has a couple good abilities and is decent 4/4 flier. Although it is black/red that isn’t a very favorable color right now (my opinion). He might be good in commander, who knows. He is only worth 35 cents and I pretty much got nothing from this pack. Nothing for my Wizard deck or Brawl deck I’m building. Oh well, it’s fun to just open packs and you can’t win every time. I did get a foil Soul savage (cheap too but cool art). so it wasn’t a complete loss. Sorry again for the short video that got cutoff! Chris-Chan Final Fantasy Gameboy 3DS Gameboy DS Magic the Gathering New Listings Nintendo (NES) Nintendo 64 Nintendo Wii Playstation Playstation 2 Playstation Portable Pokemon Sega Genesis Super Nintendo Uncategorized Update Video Game Buy Video Games Yu-Gi-Oh!